Oh Em Geeeeee- Hello. Bonjour. It’s officially February — So what does that mean? I’ve got hearts, flowers, and chocolates on the brain! We’re less than two weeks away from one of my absolute favorite holidays: Valentine’s Day so today’s post is centered around the theme of love. Although most people would argue that Valentine’s day is a holiday created by greeting card companies and it's easy to get cynical, but here at Go French Yourself, we prefer to embrace it fully and get all lovey dovey. Because whether you’re single or attached, Valentine’s Day is a sweet occasion to show your loved ones just how much you care. For me personally, it’s a time for me to really honor the important people in my life. I think by now, we’ve all come to the conclusion that Valentine’s Day doesn’t have to just be for lovers. Little holidays always make a great excuse to treat yourself or others- through big or little ways- it’s totally up to you! And what better way to celebrate all the love in your life than by getting them something special? What should you do with your significant other/girlfriends/family/self ?! I have all those answer's for you in this post! I have partnered with Whole Foods Market and put together a few ideas for your for date night and everyone else mentioned above. The best part is you only have to go to one place to get all of your shopping done this year. Whole Foods Market is here to inspire you and help you spread the love with their most fab rose sale AND their Cupid's Shopping Picks throughout the whole store. There is something so fab about the traditional route of dozens of roses on Valentine's Day. No matter the love language you speak, flowers always seems to make the sweetest statement. And giving roses that give back are even better. Your Whole Foods Market purchases support healthy ecosystems and thriving farmworker communities and from February 7th through February 14th you can purchase two dozen Whole Trade roses on sale for $24.99. A team member from the Brookside Whole Foods Market or Yale Whole Foods Market floral department will be happy to wrap your bouquet, and you can pick up dinner, chocolate and ice cream at the same time. And yes you read that correctly!! Typically one dozen roses are 24.99 and you can get two dozen for $24.99 this year!!! It's insanely good. They are taking pre orders now. And if your sweetie is not a rose person, no worries. Whole Foods Market has such an enormous selection of florals. Their wild bouquets from Bear Creek Farms are one of my favorites. 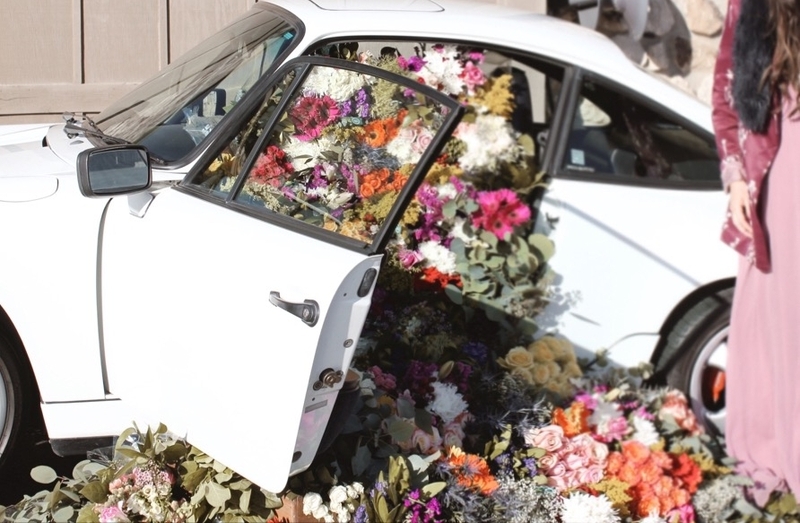 I was so inspired this year by all of their beautiful flowers and after working with Nicole at the Brookside location on an earlier wedding project we wanted to create an inspiring floral installation with Lin's vintage Porsche for Valentine's Day. Seeing the colors in the natural light really changes them. Who doesn’t love to get flowers? They are such a luxury. If we can bring nature—something wild and sumptuous—to Tulsans and other people in various states who find these photos and make them smile, the way people smile when they witness a random act of kindness, then that is a great thing. That was the goal here. It’s a really simple vision but powerful, I think, to try to create an emotional response through flowers. Nicole was such a freakin' badass executing this and I am so happy with how it turned out. So much thanks to the whole team involved to bring the vision to life. Valentine’s Day has always been one of my favorite holidays as a couple. We spend almost every moment together, so it’s not like we don’t see each other but to us, Valentine’s Day is always a reminder to set aside distractions and just focus on the two of us and this year marks the 8th Valentines Day that my Rodge and I will be spending together-- so special! In the past, we’ve done everything from a long cozy weekend snuggled up in The Ozark's to group celebrations dinners at Dalesandro's. And of course, a luxurious dinner for two at our favorite (yet overpriced) restaurant due to their seemingly, over-the-top set menu. In an effort to do things a little differently this year, we’ve opted to stay in and cook in the comfort of our newly decorated home. Our little table for two over looking the Tulsa downtown skyline is going to be just perfect, especially with the Cupid's Shopping Pick from Whole Foods Market named the Magic Maker. (You can find the various Cupid's Shopping Picks throughout the store) This one will have Guilloteau Saint Angel Triple-Creme Brie, sustainably caught lobster tails, sweetheart rib eye steaks, chocolate dipped strawberries, Valentine’s heart-shaped chocolate cake,2 dozen Whole Trade® Roses Bouquet, and Big Dipper Valentine’s Candles. OMG---I am already so hungry thinking about this! Valentine’s Day is one of those holidays that can either be delightful or depressing--we get it. But we think you will love this Whole Foods Market Cupid's Pick no matter what your relationship status is. Whether you’re single or spoken for, it’s still fun to get together and celebrate love with your best girlinas, right? We love our gal pals - Lord help any man who scorns a woman for he shall be sure to feel the wrath of her girlfriends - and so we love having a day devoted to appreciating them.The power of the 'girl squad' really is incredible - knowing that you're surrounded by people with infectious energy that'll drive you forward, be it at work, in the gym or even your mental state. So treat your tribe---! The WFM GALentine’s Day Cupid's Shopping Pick will have Cypress Grove Chevre + Dalmatia Sour Cherry Spread, assorted fresh fruit and veggie platters, chocolate dipped strawberries, 2 dozen Whole Trade® Roses and you send each friend home with a mini bouquet! What a spread! There are ladies in our lives that deserve to be recognized on a daily basis, especially on Valentine's. It’s the perfect time of year to show your moms how much you love them. The Celebrate Mom Cupid's Shopping Pick will have a Whole Trade® Tulips Bouquet, Enfusia Bath Bombs, and Chocolove Chocolate Bars – there’s a love poem on every wrapper! This is sure to make her feel appreciated just as every leading lady should feel. Such a perfect idea for the kiddos and the teachers--the WFM Top Treats for the Class Cupid's Shopping Pick is all about sending a sweet message without artificial flavors, colors or sweeteners. It will include Annie’s Valentine’s Bunny Fruit Snacks, Yum Earth Valentine’s Pops, and Yum Earth Gummy Fruits. I love the idea of one stop shopping and awesome people making my life a little bit simpler. Let Whole Foods Market make your Valentine's the most stress free it has ever been. And remember...make your dollars go a little further by taking advantage of the awesome rose special they are offering. The price of red roses nearly doubles on Valentine’s Day across the board so you can save a lot of money by shopping at Whole Foods Market. The roses are on sale from 2-7 to 2-14 however they are taking preorders right now. And the chocolate covered strawberries will be on sale 2/12-2/14. Share your plans in the comments! Thank you to Whole Foods Market Tulsa for sponsoring this post. All photography is by Jenna Mandel.